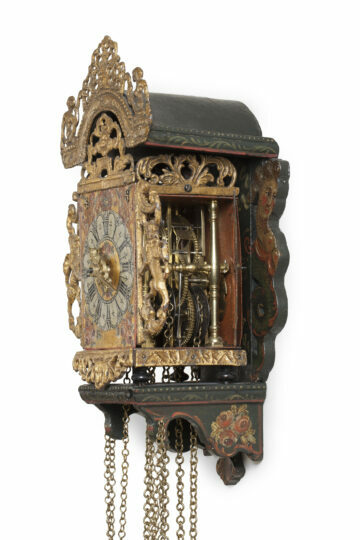 This very beautiful small Frisian wall clock has a weight-driven 12-hour birdcage movement with going and striking trains, constructed between vertical brass bars which are situated between iron top and bottom plates. 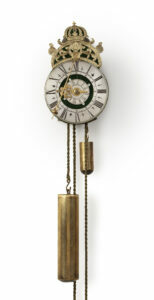 The going train has verge escapement with a short pendulum, whilst the striking train, regulated by a countwheel, indicates the hours fully and the half hours with one stroke on a bell. 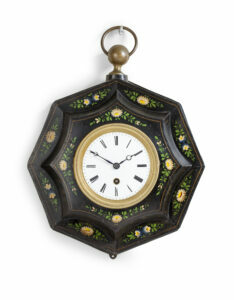 In addition, the clock has an alarm, situated in front of the going train. The polychrome iron dial has a chapter ring with Roman hour, half-hour, quarter-hour, Arabic five-minute and minute divisions, the latter with typically Dutch minute arches. The top corners are embellished by trumpet blowing cherubs, whilst the lower corners have rose spandrels, similar to the painted flowers in the centre. 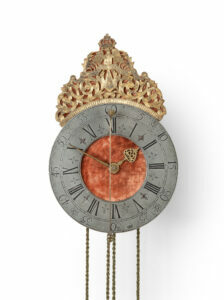 The time is indicated by a pair of finished cast-brass hands, the hour hand having an Arabic chapter ring for setting the alarm with a small alarm hand. 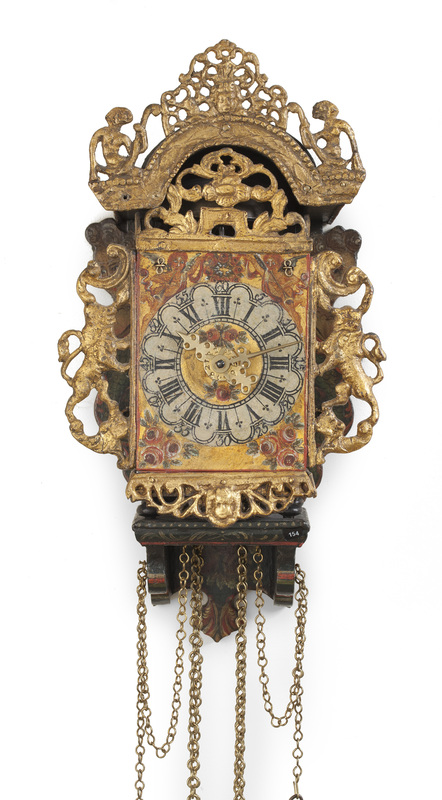 The dial is surmounted by a pierced gilt-lead fret, whilst the sides also have pierced-lead ornaments in the shape of a lion. 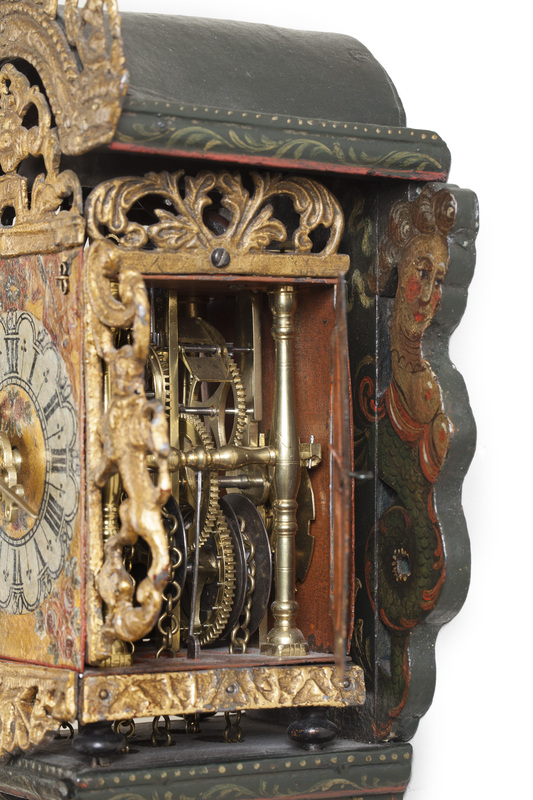 The polychrome oak case of this exceptional miniature Frisian wall clock (miniature stool clock) has trumpet-blowing mermaids to the sides. The movement is situated in an iron case which rests on four turned ebonised wooden feet on the bracket part of the oak case. It has glazed doors to the sides through which the movement is visible. These doors are painted with flowers and are surmounted by pierced gilt-lead frets. The oak case is also embellished by a pierced gilt-lead ornament on the arched top.